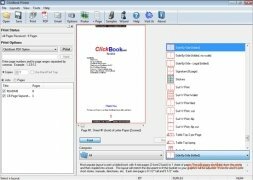 ClickBook is an application that increases the printing options of any document. Before printing a document, you will be able to reduce it, rotate it, print on both sides or rearrange the pages. Thanks to ClickBook, you'll be able to save ink, money and time on your printer. This printing tool includes very useful customization functions when it comes to printing any document. 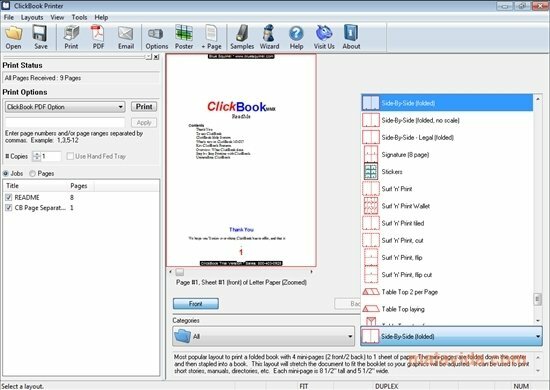 ClickBook intercepts the pages that you send to the printer, and then offers you the possibility to adjust the printing process. You will be able to rotate the document so that it fits on the paper, reorder files, combine files from different printing applications, or even convert documents to PDF format. ClickBook is very easy to use: you will only have to open the file that you want to print in any application, and when you are going to print it, you have to choose ClickBook as the printer. 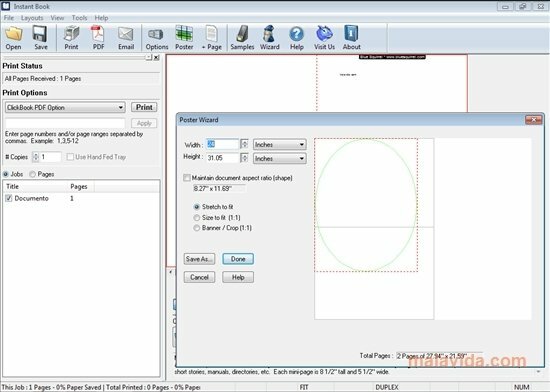 At that moment, the program's interface will open and you'll be able to select the design and other printing features. 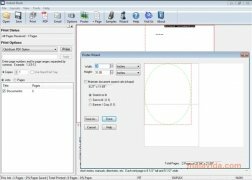 With this tool you'll be able to improve your printing and save money and time.